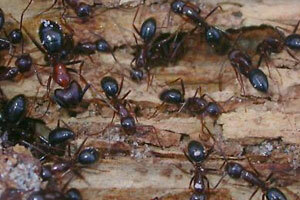 Once again, its spring and a good time for carpenter ants. In fact, wherever you go, ants are the number one pest problem in the country and are also one of the most difficult pests to treat. Ants have long been the bane of Minnesota homeowners as they invade kitchens in warm months in search of food. During the spring and summer it is common to see an ant or a line of ants making their way across the kitchen floor. As the weather continues to get warmer, you can expect an increase in the number of these tiny terrors. When temperatures rise, pests perk up. Insects are temperature-dependent. When weather gets cold, their metabolism slows and when the weather warms, their metabolism increases in activity so we see more activity in the warm months. They are small and can get in very easily. They never travel alone, so before you know it you have an infestation! The biggest mistake you can make is to start killing ants as you see them, which will not stop the problem. Bug sprays can help, but wont’ stop them from returning or reproducing. Keep this in mind… For every ant you see there are 100’s more behind the walls. Activity by these common, widespread and abundant ants is very noticeable in the springtime, as the wingless workers work (enlarge nests, forage for food, care for the larvae) and the winged swarmers swarm (fly off to start new colonies). Ants, like their relatives, bees and some wasps, are social insects. They are called social because they form communities and all work together towards the maintenance of the nest. Ants nest everywhere, from within tiny acorn seeds to massive underground networks. They create a nest in order to provide themselves with protection and an environment suitable for colony growth. Control of carpenter ants remains a frustrating and difficult job that would be much easier to do if the nests were conspicuous and easy to locate. Unfortunately, they don’t march around carrying signs. It is important to try to determine whether the ants are coming from an outdoor or an indoor nest. Finding the ants is a bit tricky, so fighting these little buggers can be a long-term battle. Nests may be outdoors in stumps, logs, hollow trees, dead limbs or firewood and they may be a hundred feet or more from the house where the ants are invading in search of food. Nests may also be inside the house in sites as diverse as wall studs, window sills, wood flooring, rafters, roof sheathing and the interior spaces of hollow-core doors. So, before things progress any more in the ant world, now is the time to contact the Minnesota pest control expert who will locate the nest location(s) and eliminate all the ant colonies before they completely take over!